Photography Blog is one of the first to review the new high end camera from Fujifilm, the Fujifilm FinePix X100. This compact camera features a large APS-C CMOS sensor with over 12 megapixels and a bright lens 23mm (F/2). The Fujifilm camera also has interesting aspects such as a new hybrid viewfinder that is both optical and electronic. This camera is targeted at serious photographers that want a compact camera that takes great pictures, but the X100 comes at a high price. Let us hear if Photography Blog think it is worth the money. Photography Blog ends up giving the FinePix X100 an extremely good rating with an overall score of 5 out of 5 stars and an “Essential” rating. 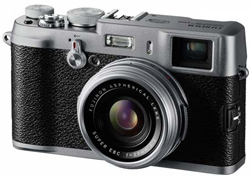 The X100 gets a perfect score on design, image quality and features, a little lower on ease of use, while it scores lowest on value for your money. If you love old school photography and wants a lot of control over your camera, this should be your choice if you have some money to spare. I would definitely invest in this Fujifilm camera if I had the money as the pictures it produces seems excellent! Read the full review of the Fujifilm FinePix X100 high end digital camera here.